There are many available resources to support you in learning more about Digital Technologies. Here we have included information on some of the resources that we have created, as well as information on local clubs, associations and competitions that will be able to support you and your classroom. Webinars, videos and other resources produced by the CSER team. There are many different organisations and community groups that can support you as you learn more about Digital Technologies, including both national and state-based associations. Digital Careers is funded by the Commonwealth Government and aims to increase the number of tertiary ICT students and ICT professionals in Australia. The ACCE is the national professional body for those involved in the use of information and communications technology in education, and has state-level member associations. The CSTA is a membership organisation that supports and promotes the teaching of computer science and other computing disciplines. The Computing at School group is a group based in the UK, with the goal to promote and support excellence in computer science education. 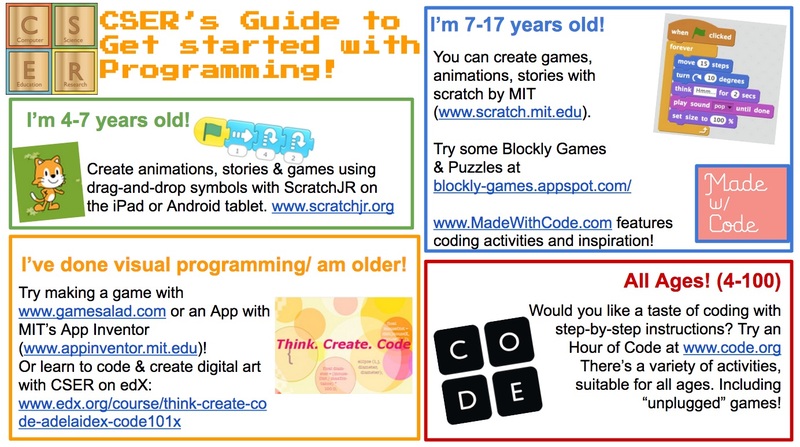 Code.org is an initiative created to get students, teachers and other individuals trying 1 hour of code to increase engagement and awareness. The website still includes a host of interactive activities and informative videos for students and teachers. The CSIRO Scientists in Schools program has expanded to include "ICT". By registering for the Program, teachers will be partnered up with an ICT professional or academic that can help support the development of learning activities or to organise a "visit" or excursion. These partnerships are flexible and can be ongoing or short terms depending on needs. Google's CS First Club Program supports local CS activities using Google's CS Club materials and lesson plans that are ready to go! Simply sign-up on their website. Google also have a number of other great resources listed on their resources page that promote CS in schools. Code Clubs Australia provides project materials and a volunteering framework to support the running of coding clubs in schools and community centres. There are also many local Computer Science competitions that you and your students can engage in. Start a FIRST Lego League in your school and provide an opportunity for students to build robotics and participate in an international challenge. The free Australian Bebras Computational Thinking Challenge for primary schools. This challenge is free for teachers and students to participate in and contains tasks that challenge students in CT, problem-solving, CS concepts, and align with the digital technologies curriculum. Google Science Fair is an online science competition, open to students between the ages 13 - 18 from around the world. Science projects include those that harness CS or technology to find solutions to problems.